I arrived San Jose 17 January, quite out of shape as far as hiking is concerned. After a period to overcome jetlag and get a few things done, I started to hike almost daily on lower hills and peaks in the area, until I felt I was ready for a strenuous one I have done several times in past years: Kennedy Trail in the Sierra Azul Open Space Preserve. I did it and now feel ready for my (approximately) annual hike up Mission Peak in the Diablo Range, across Silicon Valley to the east. (2,517 feet; 767 meters). Although the peak of Kennedy trail (at the junction with Priest Rock Trail where I turned back) is ~2600 feet elevation (793 meters), the trail head is at around 500 feet. The Mission Peak trail head is at a much lower elevation. The distance covered in today's hike was 8.2 miles, accomplished in 3 hours, 3 minutes, including rest stops and picture taking. 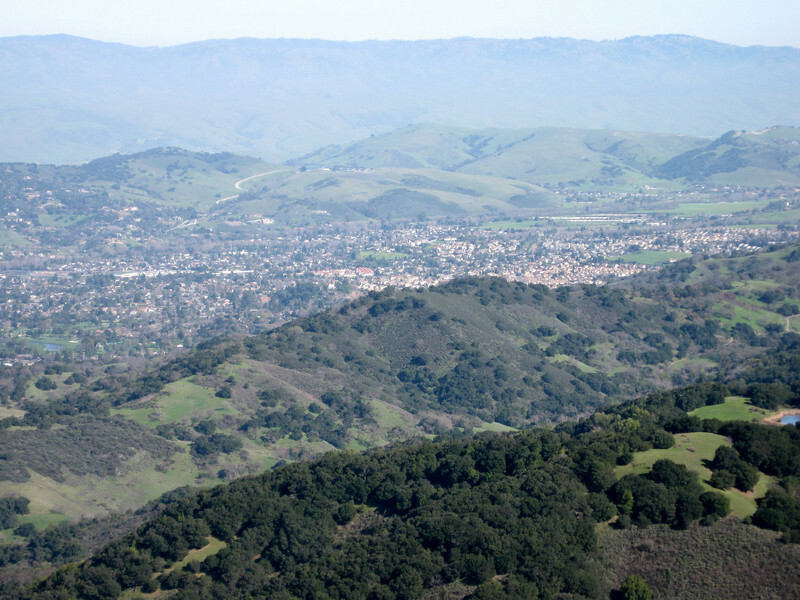 A view across southern Santa Clara Valley ("Silicon Valley"), from Kennedy Trail. The lower peaks seen here were accomplished on earlier hikes. See next image for their names and locations.